Running well ahead of schedule,the International Space Station's crew opened hatches between the Harmony module and the newly arrived SpaceX Dragon cargo ship early Saturday to kick off a busy few days of work to unload about a half ton of supplies and equipment. 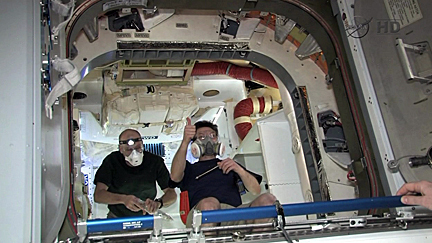 Wearing goggles and filter masks to protect against any floating contaminants that might be present -- a routine precaution when visiting cargo craft arrive -- flight engineer Donald Pettit and Expedition 31 commander Oleg Kononenko cracked open the hatch and floated inside at 5:53 a.m. EDT (GMT-4). The Dragon cargo ship, making the second of two planned test flights, arrived at the space station Friday, four days after launch from Cape Canaveral. It is the first U.S. spacecraft to visit the International Space Station since the shuttle was retired last summer and the first commercially developed vehicle to attempt a linkup with the orbital lab complex. "There was no sign of any kind of FOD (foreign object debris) floating around in the atmosphere inside," Pettit radioed mission control in Houston a few minutes after completing an initial inspection. "It kind of reminds me of the cargo capability that I could put in the back of my pickup truck. And the smell inside smells like a brand new car." SpaceX holds a $1.6 billion contract to to launch at least 12 Dragon missions to the space station to deliver some 44,000 pounds of equipment and supplies. Another company, Orbital Sciences, holds a $1.9 billion contract for eight missions using that company's Cygnus spacecraft, scheduled for its first test flight later this year. For its space station test flight, the Dragon carried a relatively light load of lower-priority items, including 674 pounds of food and crew provisions; 46 pounds of science hardware and equipment; 271 pounds of cargo bags needed for future flights; and 22 pounds of computer equipment. For routine space station delivery missions, the spacecraft will be able to carry six-and-a-half tons of pressurized and unpressurized cargo. The station fliers will have less than a week to unload the Dragon before the always changing angle between the sun and the space station's orbit results in higher-than-allowable temperatures. The Dragon spacecraft will be detached from the station May 31. Unlike Russian, Japanese and European Space Agency cargo craft, the SpaceX Dragon is equipped with a heat shield and parachutes for a splashdown in the Pacific Ocean just off the coast of California. Since the shuttle's retirement, NASA has not had a way to get experiment samples, broken equipment and other gear back to Earth. The Dragon spacecraft will restore that lost capability. For its first return from space, the capsule will be carrying 315 pounds of crew items, 205 pounds of experiment hardware, 760 pounds of space station system components and 86 pounds of spacewalk hardware. For routine resupply missions, the Dragon can return more than two-and-a-half tons of material.